The GOP's vice presidential nominee was in the hizzy for the Flyers' opener last night. The chorus of boos that began as soon as she was seen were blasted out by some loud music and (some have said) artificial crowd noise. Palin walked onto the ice before the start of the game to help drop the ceremonial first puck. Yes, she actually had help. Video after the jump. The City of Brotherly Love gave Palin a mixed welcome — some fans booed, some stood and cheered — at the Wachovia Center before the Flyers started their season against the New York Rangers. 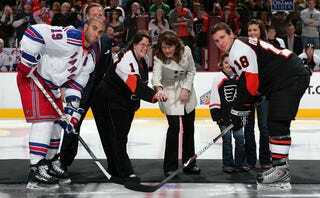 Palin was invited by Flyers owner Ed Snider to drop the ceremonial first puck of the season, and was joined at center ice by two of her daughters and the winner of a team promotion for the "Ultimate Hockey Mom." She even got a peck on the cheek from Rangers captain Scott Gomez, an Alaska native.